This year’s theme was Cookie Exchange. 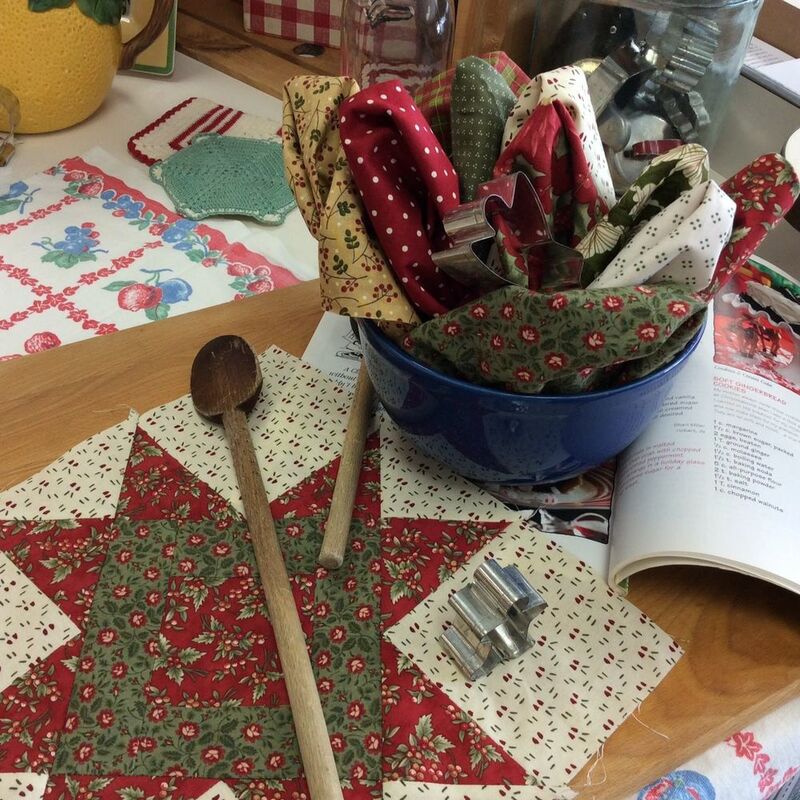 It sounds as delicious as the quilts will look by the time they’re finished! Look for Block Party 2018 to select your new choice for the year, beginning in September, 2017. Pick up the first block in September on either the second Monday or second Saturday. Each month, we’ll highlight a particular star block. It should be lots of fun as always! OATMEAL COOKIES. These blocks will be dark, decadent shades of blue and brown in 1800’s reproduction prints. Sounds so warm and autumnal, don’t you think? 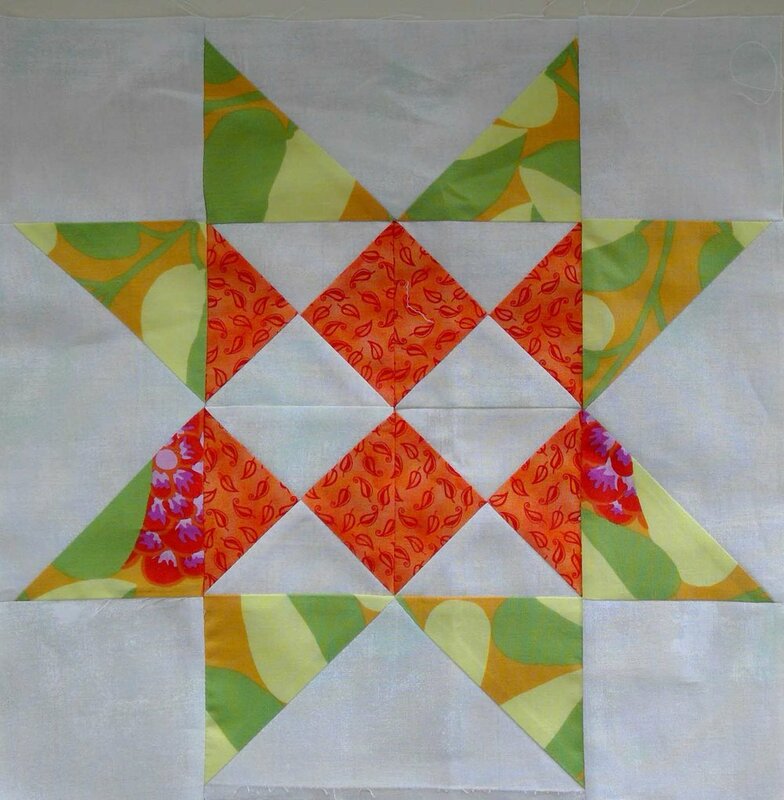 This one will look stunning with all those old-fashioned star blocks. After all, traditional is timeless. GINGERSNAPS. 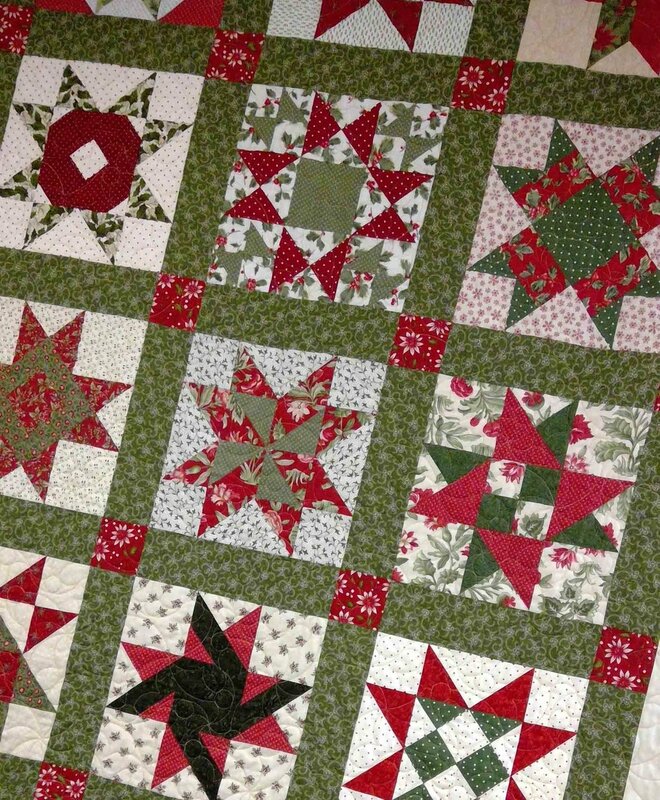 Celebrate the most wonderful time of the year with a seasonal quilt. Your top will be done in plenty of time for next Christmas, since the last block comes in August 2017. 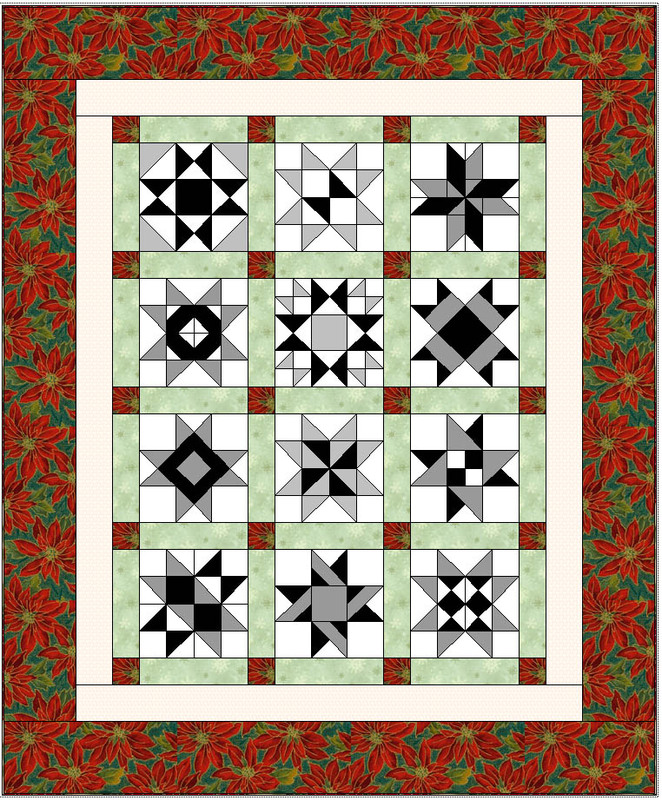 Expect each block to be made up in Christmas reds and greens for a holly-jolly look! LEMON BARS. Go bright and bold with Kaffe Fassett prints! Each block will have Grunge Snow White as the background print – it is really a nice complement to Kaffe’s designs. This one would make a great summertime quilt for your bed. Prairie Point Block Party guidelines will remain the same: You may choose either the second Monday of each month or the second Saturday of each month as your designated pick-up day. The blocks will cost $3.50 for your first block and the following 11 months if you personally bring in your completed block (from the month before) on "your day". 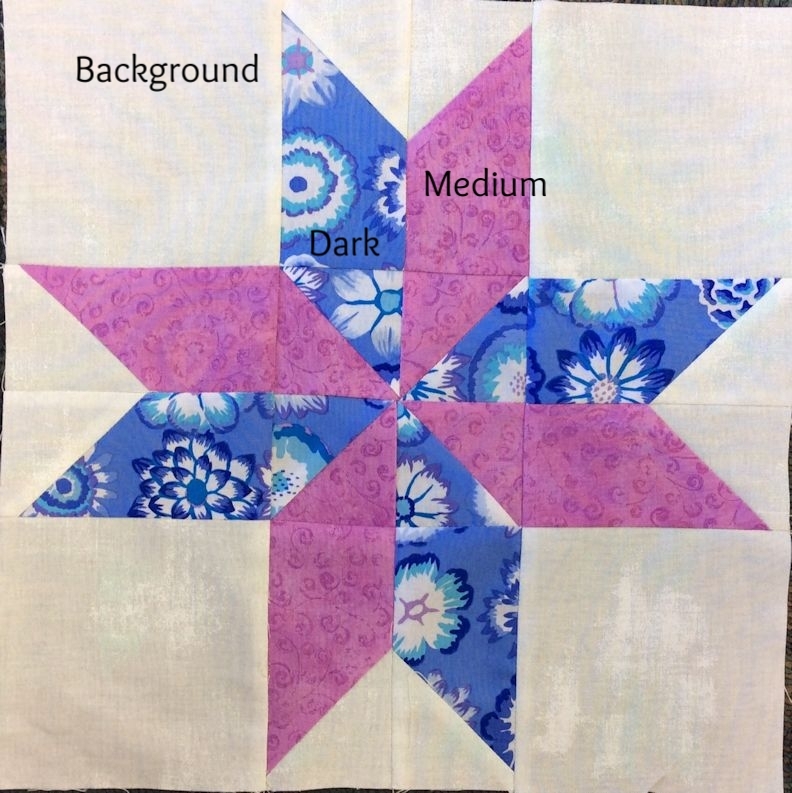 If for any reason you cannot come on your day the block kit will cost $5.50 (still a bargain for the fabrics and pattern to complete your 12" block). At the end of the 12-month program, setting kits will be available for purchase. 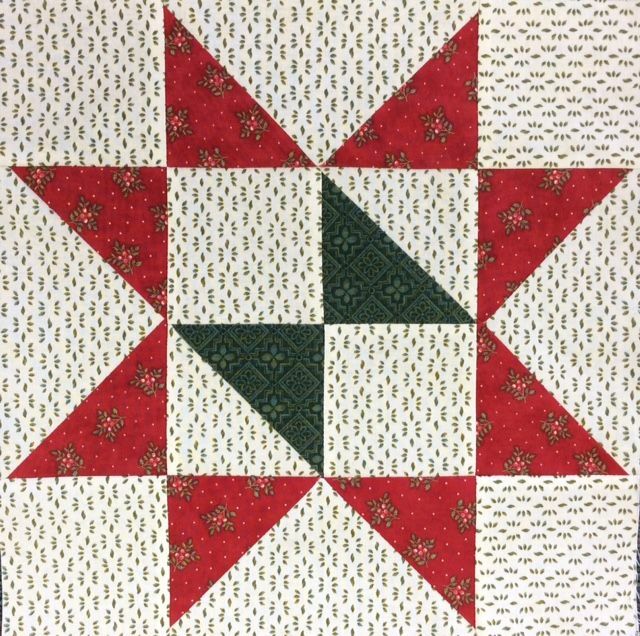 The pictures and descriptions of the finished quilts will be shown in June for your consideration and you may sign up for one at that time. A mail order option is available for out-of-towners. Call the shop for details. Each month we will post pictures of the finished block right here in each of the three colorways. 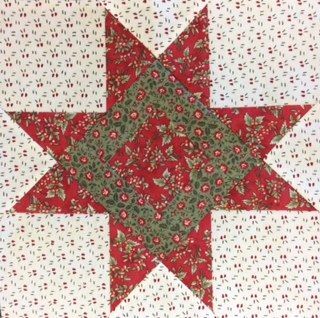 The first block, September's 'Braced Star', is the beginning of a series of star blocks that will help improve your piecing skills. 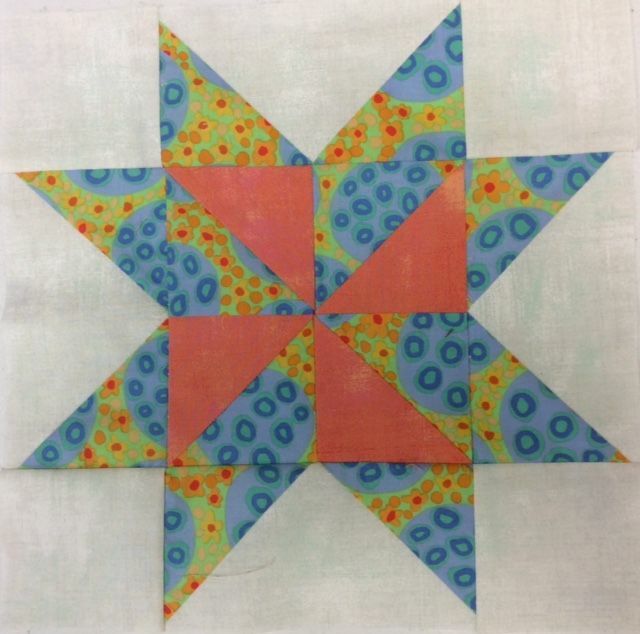 The square with border around it will measure 6-1/8" when it is completed. Spray starching your fabrics before cutting out your squares and rectangles will help when sewing them together. Be sure to use an accurate 1/4" seam allowance. See the Blog Post on Block Party -- it tells more about this block. Oops! We goofed again. Our first one this year -- I hope there are no more! Piecing Instructions: 1. 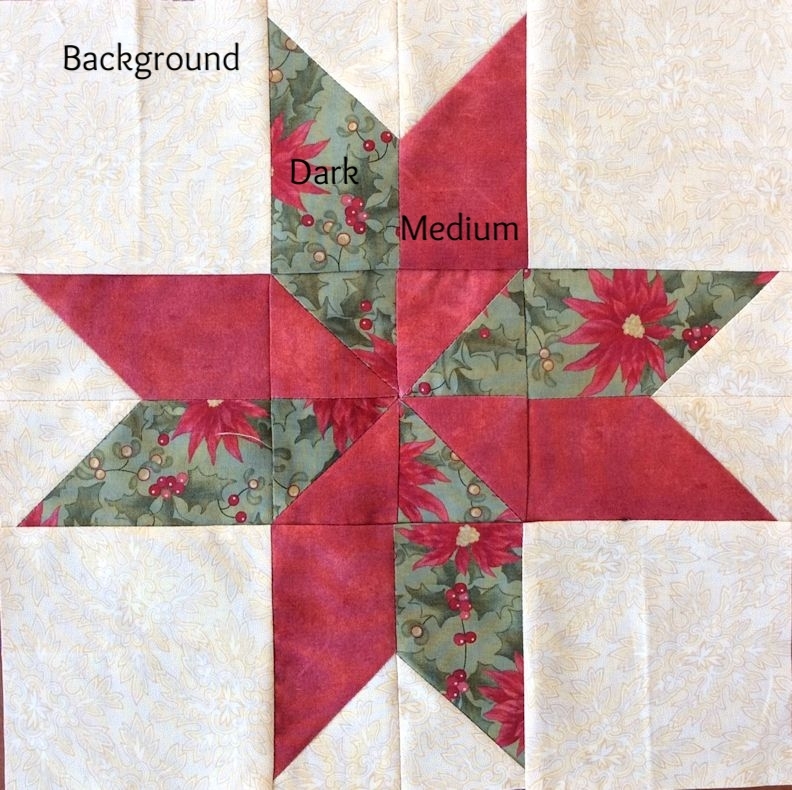 (D) should say place a 4" medium square on the corner of the large triangle, not 4" background square. Some of the month 3 Gingersnap kits have backgrounds that are exact or not quite enough. 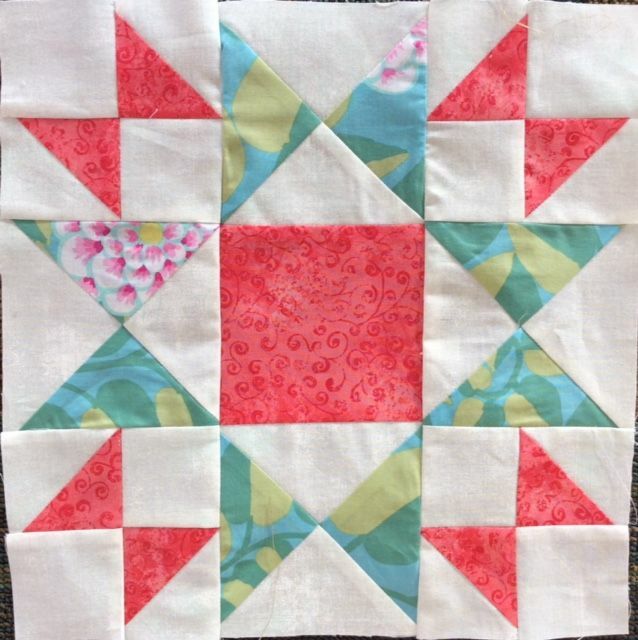 If you have 20" then try to get all 8 of the 2-1/2" squares from that length. If you are short then let us know and we will cut you a square. TIP: Identify dark and medium correctly. Step 1 directs you to do EXACTLY as diagrammed. Please do! Use dark and medium placed as shown; draw lines as shown and compare with diagram; then sew and cut seam away. Error: note change for above blocks in large caps: (D) Place another 4” MEDIUM square on the corner of the large triangle. We are halfway there! We never get tired of these blocks here at Prairie Point -- they continue to be fun and beautiful to us. We hope you are enjoying them. The March block turned out awesome! We have selected some of our setting fabrics and looking at more soon. You will love them! April -- I'm posting these a bit early. There is a Blog post on this block. May -- Flying Geese and Snowball. Pretty easy. Next month you can sign up for your setting kits. 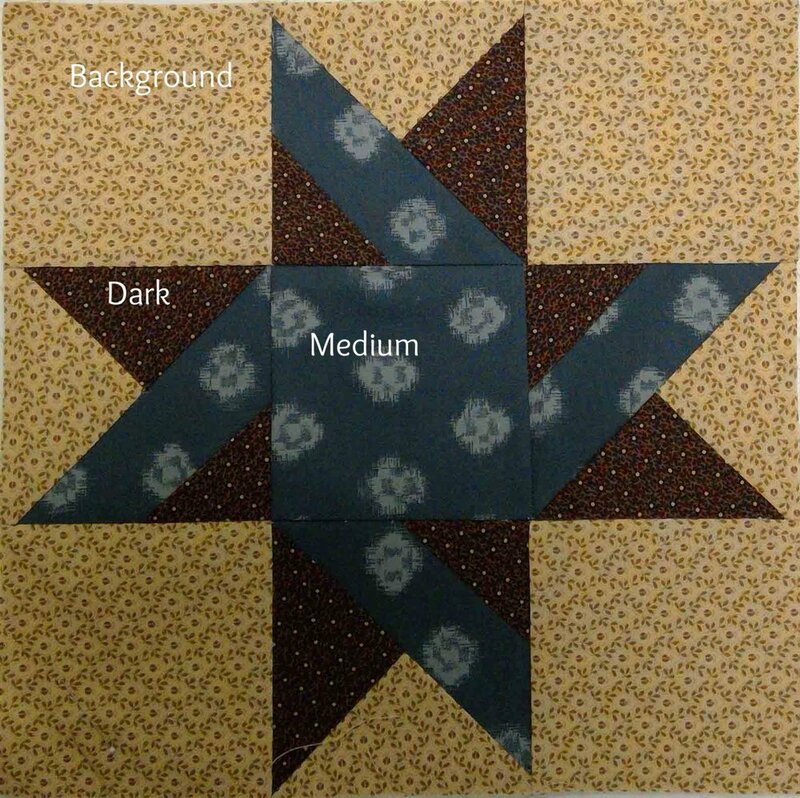 June -- Remember, just because a fabric is labeled dark, doesn't mean it is the darkest print in the block colorway you are making. It works this way in all months' blocks. Two more months to go! Begin to sign up for setting kits this month. Setting kits are totally optional, but you may find them irresistible. Signing up guarantees you a kit. 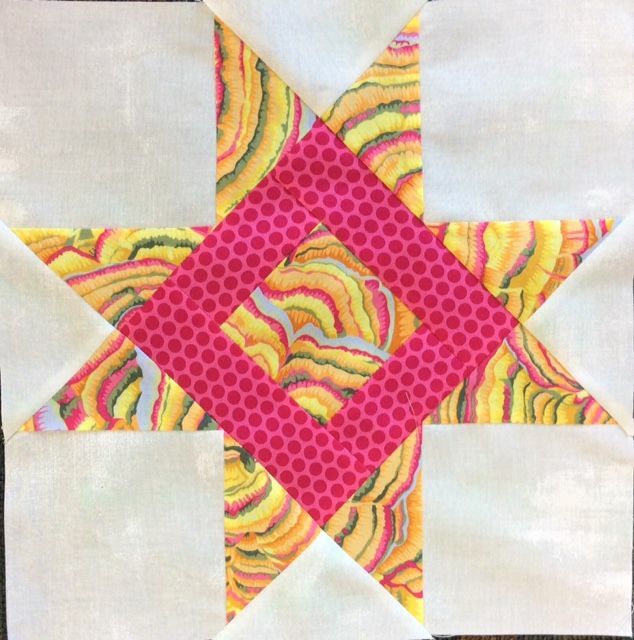 August above is the last block of the Cookie Exchange series. The quilts are complete! and Setting Kits are available. Oatmeal Cookies finishes at 83" x 98". The setting kit is $95. Ginger Snaps finishes at 72" x 87". The setting kit is $72. Lemon Bars finishes at 74" x 91". The setting kit is $76.